There are a lot of reasons why we need to start exploring new models of ministry in the life of the Episcopal Church. Most of these reasons, for me, have to do with a genuine and gospel-based desire to be more collegial and collaborative and mission-minded – to get over ourselves, get outside of ourselves, and better form disciples of Jesus Christ. That argument goes over pretty well with the lay leaders I have the pleasure of working with at St. George’s, Valley Lee. I’m also blessed that several neighbor Episcopal congregations – their clergy and lay leaders – are also on board with this desire to do more and be more, together. Pitching ‘collaboration’ and ‘mission’ to top-level leadership in the Episcopal Church comes with conceptual approval, but also hesitancy and critical distance from suggestions from the field, coupled with good, if not uselessly airy and idealistic wonderings about whether and how we can “tweak the existing system(s)” and who has the power and authority to do so anyway. The further you get from day-to-day life on the ground in the Episcopal Church, the further you get from life as a parish priest or congregational lay leader, the more you see only the meta-data and larger trends. Here’s yet one more reason why we need to start exploring new models of ministry: we can’t afford the current one much longer. In 2012, the missions and congregations of The Episcopal Church brought in $1,303,458,185 in pledge and plate contributions. That’s based on the 6,667 congregations and missions – both domestic and non-domestic. Simple division gives us $195,508 as, let’s say, Average Pledge & Plate Giving. I know that pledge and plate giving is one part of determining the Parochial Report’s Normal Operating Income (NOI), and I know the NOI is more than pledge and plate. 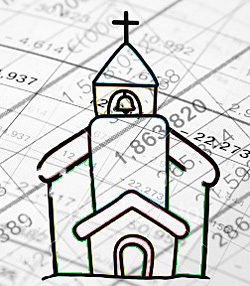 But let’s use this $195,508 number for three reasons: first, Kirk Hadaway and the Episcopal Church statistics gurus don’t report the average NOI (and I really don’t care that much to search further); second, the latter – namely, pledge and plate – is the singularly most reliable, albeit lagging indicator of actual ministry-based participation and giving in a given community; and third, I’ve already written about how utterly useless and stupid the NOI is. Take our average Episcopal congregation, then: St. So-and-So’s, with their annual pledge and plate offering of $195,508. Let’s say they tithe to the diocese (give $19,551), leaving $175,957. Now let’s do the math. Based on the clergy compensation scale in the Diocese of Washington, a priest with, let’s say, three years of ministry-related experience should earn at least $49,057 in cash stipend, but when you follow the diocesan personnel guidelines you’ll also factor in pension contribution (18% of the stipend is $8,830.26) and health insurance (two-person medical and dental in 2014 is $18,336) and a modest car and cell phone reimbursement (say, $5,000) and a continuing education line item (go with $1,000) and you’ll get the total amount budgeted to having a full-time clergyperson is $82,223, leaving a remaining $93,734. A part-time organist with a bachelor’s degree and a mere five years’ experience, one who’s contracted to work only ten hours each week, would earn $12,524. Let’s also be exceedingly kind to this fictional congregation and suggest that the music director, in question, doesn’t need health insurance and opts out of the church providing some measure of retirement savings. Looking at the numbers, though, a local colleague of mine just hired a new organist / music director and the going rate, she reported, that most of the applicants quoted was $300 per service. With 52 Sundays in the year and three extra services (certainly Christmas Eve and maybe one or two others) that’d be a total compensation of $16,500. Splitting the difference, then, between the diocesan scale ($12,524) and the actual going rate ($16,500) let’s say that a gifted and competent music director would cost $14,512. Between the rector ($82,223), part-time parish administrator ($31,732) and very part-time music director ($14,512) this sample congregation would’ve spent $128,467 — and that’s not including someone to clean and, maybe, a bookkeeper and/or a nursery caregiver or, perhaps, a formation director or youth minister. Let’s pretend that the floors magically clean themselves and that there’s a sufficient network of volunteers. Even among that limited personnel pool – rector, parish administrator and musician – that’s 65% of St. So-and-So’s pledge and plate collection. That startling number puts an even finer point on the financial struggle of most congregations; Kirk Hadaway from The Episcopal Church, in fact, softens this reality by focusing on Normal Operating Income (NOI), not pledge and plate. Based on a 2008 survey, Hadaway reports that congregations with an Average Sunday Attendance (ASA) between 51 and 100 spent 52% of their total NOI on staff, and those with an ASA of 151 – 350 spent 51%. Those percentages go down as the ASA gets smaller than 50 or larger than 350 (those with ASA between 1-25 spend 31% of the NOI on staff, 26-50 spend 45%; conversely, those with 351+ spend 49%), but that’s because in smaller congregations there is hardly any staff support and a congregation has to have a lot of people in order for it to sustain the idea that there can be a full complement of staff. I know that ministry is more than paying staff positions, but it is hard to imagine that these reductions won’t have a negative impact on how the Episcopal Church is able to deliver meaningful, transformative encounters with the living God in the various contexts and communities across this country. The unquestioned dominance of the one-parish/one-priest system is financially unsustainable, and we are quickly heading to a church in which there will be plenty of buildings but decreasing ministries. If you’re running the numbers in your head, St. So-and-So’s would, at this point, have $67,041 remaining. They would need to budget that money on heating gas and/or oil ($10,000? ), electricity and other utilities ($7,000? ), household supplies and modest kitchen expenses ($4,000? ), office expenses and staples and copier leases and paper and information technology support and needs ($7,000?). They would need to find some money for communion bread and wine, and they’d barely squeak out enough to really support the ministry of the altar guild and provide for meaningful and dynamic worship experiences ($6,000?). They’d most certainly continue to defer maintenance on their buildings and grounds and I’d suspect that they would only have a little bit to invest in modest clean-up or capital improvement efforts ($5,000?). This isn’t even mentioning Christian education programs ($10,000?) or social justice outreach work ($10,000? ), ministry and mission that is the bread and butter of the Body of Christ. Apparently there won’t be much, if any money left-over for supply clergy or guest organists, so those key ministers, the clergyperson and music director and parish administrator, will be limited in their ability to go away on vacation or retreat. So much money is spent on presence and personnel and property, I’ll bet, that there’s not a lot of room for dreaming about mission and ministry and what we can be doing in the wider community to make disciples of Jesus. At this point, we’re down to about $8,000 remaining in wiggle room. Add to this that even if the clergyperson has a truly missional calling and is ready to serve in this ministry context, the rector will, if s/he tries to follow the clergy compensation scale, price her/himself out of that congregation in less than five, probably fewer years of service there. That is to say, when that rector gets to eight years of ministry – this is, again, based on the Diocese of Washington’s 2014 clergy compensation scale – s/he will be eligible for such a cash stipend and comparative increase in pension, not including the obvious increases to health insurance and other costs, such that the clergyperson’s entire compensation package will consume any remaining surplus in the parish’s checking account and start to drive down spending in other areas. In short, the clergyperson has less than a five year ministry in that place, lest s/he be the very reason why the congregation has to raid their savings account or investment income in order to manage cash flow, pay the heat bill, buy sufficient crayons for the Sunday School, or provide substantial help to someone who is truly in need. And it is sure to follow that a congregation with a nearly guaranteed turnover of clergy leadership every five years, on average, is a sure bet for a congregation that will only continue on a downward spiral in energy — sure it’ll spike with the new arrival but fall just as quickly thereafter — and a subsequent decline in time and giving and potential. Not only can we much longer afford the currently dominant model of ministry in the Episcopal Church, but this is a time in which the moment is hot and, frankly, will quickly pass us by. Like it or not, we’ve arrived pretty late to the evangelism / mission game, but not so late that our numbers – our people and money, our total resources – are insufficient to the task at hand. We’ve actually got a healthier level of resources than many churches in our present situation. But this is not a time to commission further studies or wonder who has the power to do what or ask fairly inane questions about how to transition the dominant system or shift the blame between diocese and congregation. No, this is a moment in which we know where we need to go and we have a pretty good stock of resources by which to do it.